This full-day, small-group tour begins at the new commercial space in downtown Jasper. Upon arrival meet your guide and receive all technical equipment needed for the day, then grab a bagged lunch. On the bus ride to the Athabasca Glacier, the certified tour guides will highlight many of the natural wonders surrounding the Icefields Parkway. 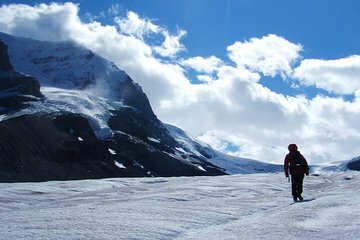 After arriving at the Athabasca — a classic mountaineering highlight in the Canadian Rockies — your guide will lead the way onto the glacier for approximately two hours of exploration. Enjoy professional instruction regarding staying safe in an alpine environment from a professional guide who has a thorough understanding of the area and its current conditions.